Your watercolors are great. Love the colors on the flowers and the balconies. as always your paintings are vibrant and beautiful. One day I will own one!! These paintings are so joyful! You must have been happy when you painted them. Now I feel your joy too. Thank you for sharing them. Travel light. What a wonderful way to remember a trip. Your watercolors capture the warmth of the country. 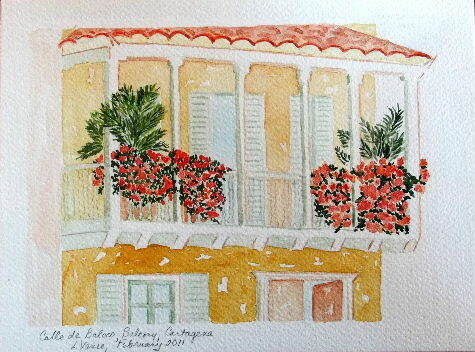 I particularly liked Calle de Baloco, Balcony, Cartagena. Excellent! Probably better than some of the food if one can make such a comparison.